Dr Raboteau, second from right. 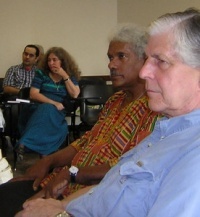 To his right John N Perkins psychologist from Princeton and to his left Olga Bukhina, two of the other speakers at the conference. Dr Raboteau is former dean of faculty at Princeton University and professor of African American studies. This paper is from the Alexander Men Conference in New York 2004. “In the world but not of the world,” this phrase encapsulates a perennial tension between the Church and culture. On the one hand, the incarnational character of the Church establishes her firmly in history, in this particular time, place, and culture. On the other, the sacramental character of the Church transcends time and space making present another world, the Kingdom of God, which is both here and now and yet still to come. Throughout the history of Christianity, the temptation to relax this tension has led Christians to represent the Church as an ethereal transcendent mystery unrelated and antithetical to human society and culture. Or, on the other hand, it has prompted Christians to so identify the Church with a particular society, culture, or ethnicity as to turn Christianity into a religious ideology. Because we are “not of the world” Christians stand over against culture when its values and behaviors contradict the living tradition of the Church. So it was that early Christians refused to conform to the world by honoring the emperor with a pinch of incense offered before his image. “Being in the world,” the Christian acts as a leaven within culture, trying to transform it by communicating to others the redemption brought by Christ. Thus the early Christian apologists stood within culture as they attempted to explain Christianity in the philosophical and cultural terms of their times and recognized within the culture adumbrations of Christian truth waiting to be revealed. Christians cannot be distinguished from the rest of the human race by country or language or customs. They do not live in cities of their own; they do not use a peculiar form of speech; they do not follow an eccentric manner of life. This doctrine of theirs has not been discovered by the ingenuity or deep thought of inquisitive men, nor do they put forward a merely human teaching, as some people do. Yet, although they live in Greed and barbarian cities alike... and follow the customs of the country in clothing and food and other matters of daily living, at the same time they give proof of their own commonwealth. They live in their own countries, but only as aliens. They have a share in everything as citizens, and endure everything as foreigners. Every foreign land is their fatherland, and yet for them every fatherland is a foreign land... They busy themselves on earth, but their citizenship is in heaven. No less now, than then, we Christians continue to wrestle with our relationship to culture – an issue which Fr. Alexander Men thought about deeply. His life of active openness to the world and his historically informed reflections on the Christian’s engagement with the world offer us important resources for shaping our thought and action today. Why do we have this tendency toward nostalgia? In a word, fear. The desire for simple solutions, the need to see things in black and white, as us vs. them, the Church vs. the world, rather than the Church for the world, is rooted in the difficulty of living the paradox of being in the world but not of the world. Fear pushes us to abandon one side for the other. Fr. Men made a famous contrast between two stances of Christians to the world, one open, one closed. The open stance is represented by Dostoevsky’s elder Zossima, who is gentle, loving, embracing of people and creation. He sends Alyosha back into the world from the monastery to deal with his dysfunctional family. Zossima’s opposite, Elder Ferrapont is a rigorous ascetic, who condemns the laxity of the former and vindictively celebrates his apparent victory over his opponent when the corpse of the deceased staretz starts to stink – a sign of corruption instead of sanctity. Now most of us prefer Zossima over Ferrapont, but Fr. Men, showing the capaciousness of spirit that ought to our model moves beyond the literary antithesis created by Dostoevsky to offer a profound reflection upon the contrapuntal traditions within Christianity. We need both asceticism and compassion. He points to St. Seraphim of Sarov and the elders of Optina as exemplars of those who choose not to simply embrace the world, nor to use Christianity as a stick with which to beat the world over the head. How does this play out in practice for us in the present? In regard to the issue of pluralism, which seems so threatening to our religious identity when we reduce it to relativism, Fr. Men has some interesting, we might say radical ideas. His wide-ranging study of world religions led him not to condemn them but to look at the good within them and to claim that Christianity is exceptional only in the person of Christ, who is God’s answer to the religious hunger of mankind expressed in other religions. He is even so bold as to suggest that the divisions within Christianity may be part of God’s plan to ensure pluralism within our fallible human history lest we turn the Church into a monolithic idol and reduce the Gospel to an ideology of national or ethnic pride. Offering a strong critique of materialism, he argued that people are hungry for what Christianity has to offer and that is simply the authentic within Christianity, the Gospel. Realization of this profound fact should lead the Christian not to triumphalism, but to repentance. For church history teaches us that what we have preached so often has not been the Gospel, but ourselves. Ultimately, we have confidence, not in ourselves but in the Spirit, who will achieve the transformation within us and within our culture. Let me end my remarks with another quotation from Fr. Men’s words, a source of hope and humility, as we, like Frodo, face the times in which we live and choose what to do within them. Preaching. This means we have to find a common language with the people of our time, not identifying with them completely, yet not isolating ourselves from them behind an archaic wall. We have to state anew, almost as if for the first time, all those questions which are placed before us by the Gospel. Witness. This means that we still have to determine – if we have not yet determined – our life’s goal, to find our place in life, our place not in the usual sense of the word, but in our relationship to all of life’s problems. And finally, Presence. This means we must learn how to pray at all times and deepen our experience of the Mysteries, so that our witness may not be a witness about ideology but of the living presence of God in us.